Last week while I was folding washing after school I heard a crash from the kitchen. The crash followed by that momentary deafening silence, where you know that the culprit knows they have done something wrong. Then the panicked shouts and tears begin. So what was that crash? It was my daughter learning a lesson … the hard way. This has me thinking. We are all given lessons on a daily basis I’m sure, often choosing to reject or just plain ignore them, carrying on without modifying whatever needed to be addressed. I know I’m guilty of that. This time, the lesson was for Nat: about not climbing the shelves of my pantry – that’s a repeated rhetoric. She decided she wanted her lolly jar (I keep them up high, under my control) and instead of waiting to ask me, she climbed the shelves to help herself, in the process knocking over the bin that holds my oils and sauces. Mostly glass bottles which hit the tile floor with an almighty noise. 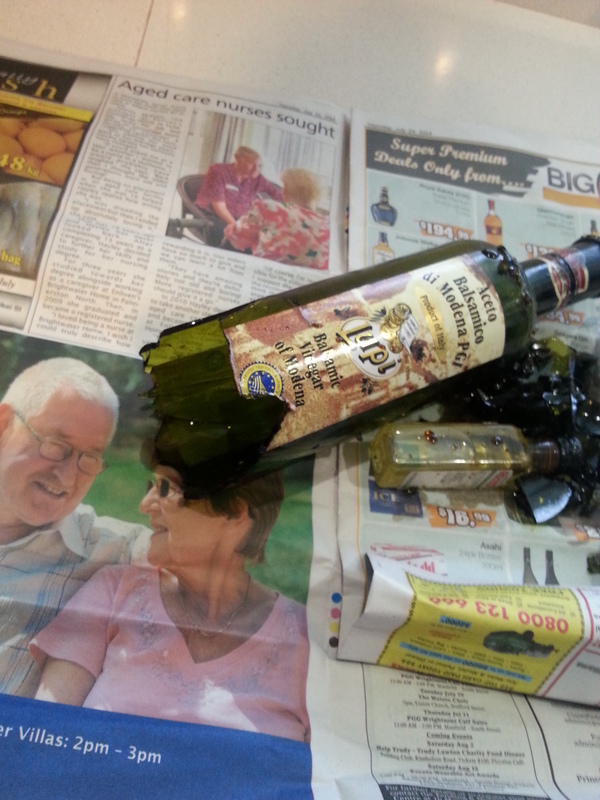 Thankfully only one bottle broke, the contents and glass contained to the bin. And on the bright side, the balsamic smell in my kitchen was great! So all in all, not a big deal. After calming Nat down (who aside from a dented ego was fine) I simply told her not to worry about it, it was just one broken bottle, and although it was the hard way to learn a lesson about not climbing the shelves, I hoped that maybe she finally understood it. “But mum, what’s the easy way to learn the lesson then? That my dear, is listening. Listen when I tell you things”. Well yes. Although I know there’s something God is trying to teach me at the moment and rather than fully open my ears to Him, I keep trying to alternately fix it my way or just ignore it. Until I hit the figurative brick wall (about every six weeks!) which leaves me completely frustrated and upset. I know there’s a problem, and I know it needs to be dealt with but my stupid arrogant self seems to feel the need to ignore the answers which are surely quite within my reach. Why do we do that? Surely I’m not the only one? I’m grateful for this simple illustration how we can and should learn lessons. The easy way. By listening to the one who knows best (for her, mama knows best!) then changing our actions/thoughts accordingly.